Six Simultaneous Precision Strobe Tuners for your guitar. Fast. Accurate. Noise resistant. Can use the built-in mic on your iPad. With multiple simultaneous strobe tuners, you don't need to wait for your room or recording studio to become quiet enough. You don't need to wait for a tuner to lock onto each note. You don't need to wait for a needle to finish moving. If you're really good, you don't even need to tune one guitar string at a time. With multiple strobe tuners, you can see if one string shifts in frequency while tuning another. You can also see if plucking a string hard on your guitar causes the notes to "bend". Just watch the waterfall waveforms overlaid on each string. When the waves for a particular guitar string synchronize or line up vertically, and stop leaning and shifting left (flat) or right (sharp), you are precisely in tune with an internal equally-tempered digital oscillator. 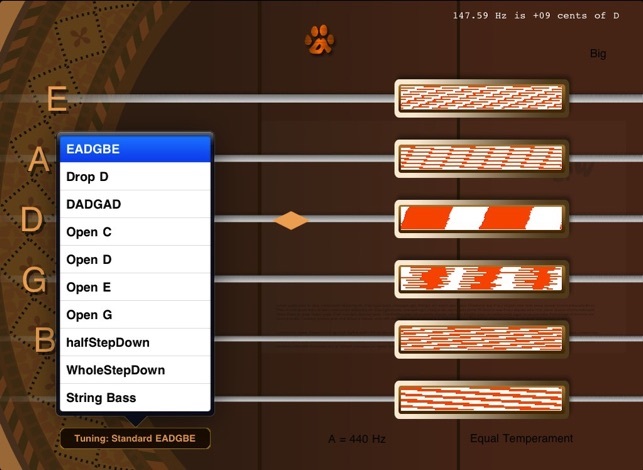 inTuna HD supports up to 4 custom intonation presets, where you can individually vary the reference frequency of each string in 1 cent increments (+-20 cents) from equal temperament, and quickly switch between your custom presets. The A440 master tuning reference is also adjustable from 415 to 455 Hz. 8 alternate tunings (Standard EADGBE, Drop D, DADGAD, etc.) are supported, plus a special bonus Bass Guitar and String Bass mode. Bug fixes for iOS 10 and 32-bit iOS devices. This is a great guitar tuner. The price fits since it makes tuning the guitar so easy, even for a novice like myself. 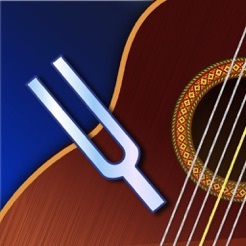 With tuners that only play the chord, it is very hard to match the sounds. With this, you see how sharp or flat your chord is and can adjust it quickly without being afraid that you will snap a chord by accident. Also, this will let you tune your guitar in 1-2 minutes or less. Super helpful and simple! The best 5$ tuner in the world, go ahead and take the Pepsi challenge, you won't regret it. Easy to use tuner, great for beginners and cheaper than most digital tuners!